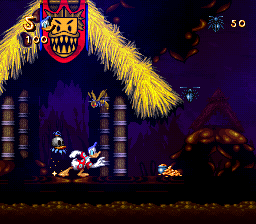 Donald in Maui Mallard is the original Genesis version of Maui Mallard that was only released in Europe for some reason. The reason I'm covering this version too is because this and the SNES versions are vastly different when you put them side-by-side. I find it interesting that the chapter set-up so far reflects how I've thought of this game as a child. Oh boy. Maui's got himself in trouble now. Just how will he get himself out of this one?